I am such a delinquent. It’s been almost two weeks since I’ve been here last and I have nothing to show for it but a sandwich. I know. And I promise, or at least very fervently hope, to have something fancier for you when I next post. But for now, let me just say with as much passion, that this is one of my very very favorite sandwiches. Ever. In the history of mankind. Plus, it’s a breeze to put together, only 4 ingredients (including the bread), and highly adaptable within the same theme. So you see, it’s not just any sandwich I leave you with. ** Arguably one of the best local food hacks ever. Must try soon!! ** It’s Halloween season, and though I was too busy to whip up some homemade treats, we did manage a fair bit of costume shopping 🙂 It’s Super Girl, Pirate, Cheerleader, and Hawaiian Dancer this year! What are you planning for Halloween? ** Next book purchase will definitely be this! ** I thoroughly enjoyed two food blogger related dinners I attended over the past couple of weeks. One was a dinner organized by Pinoy Eats World and Mr. Delicious to showcase his artisanal local wagyu corned beef. The other was arranged by the group behind Table For Three, Please: a gastronomic delight of a journey called Dinner for Dessert at the Goose Station. Both were a lovely mix of good food and good people. Love reconnecting with old friends and meeting new ones! ** Nutella-Stuffed Brown Butter + Sea Salt Chocolate Cookies. What more do I need to say? And now, onto the sandwich. As you can probably already tell from the photo, the sandwich’s basic components are cheese, bacon, and some kind of sweet jelly or syrup. This love affair started many years ago when I was based in Amsterdam for work and I would make this with bacon, smoked Gouda, and stroop (the Dutch sugar syrup which is dark and duskily flavored). Today’s incarnation is made with a new favorite combination: bacon, guava jelly, and melted raclette cheese. I know this may seem strange to some but trust me, the combination of the sweet and sticky jelly, pungent and melty cheese, and smokey and crispy (not to mention meaty and fatty) bacon is magical. Feel free to experiment with different cheeses and jellies and syrups. I’m sure this would be fantastic with maple syrup or honey. 1. Great snap of you – and I can shake hands with another Benefit and Soap & Glory girl! 2. Thanks for the book recommendation, buying it off Amazon now! 3. Your cheese, stroop, bacon and Dutch references have me totally hankering for a pannekoek with all that good stuff on!! Scrumptious! Bacon, cheddar and onion sandwiches with Branston pickle are just so scrumptious. That's one super delicious sandwich. You don't need to apologize for sandwiches! Especially not sandwiches filled with bacon and cheese and onion. Mmm, sandwiches…. I prefer my sandwich with any (but only one) sweet component, although my favorite is mango jam. When I offer that sort of sandwich to anyone (who's used to our Pinoy sandwich with a thin slather of flavored mayonnaise), I no longer explain what's in it. I just say, try it first, and they love it.Funny thing is they can't hide that "expression" in their faces when they realize what the ingredients were. Hehe. Have a good and safe week ahead. Stroop – rare as it is in the Philippines – makes a lovely counterpoint for salty bacon. 🙂 Oh, if you don't have it, drizzling Grade B maple syrup over bacon on toast comes a close second! Ah, I'm new to your blog and I love it! My favorite sweet and savory sandwich = brie + prosciutto + strawberry jam. The other sandwich ideas are great as well. I really do like a sandwich with a little cheese along with the other ingredients. I once had a bacon, Brie and cranberry panini from a little sandwich shop near the office, and it was amazing! Turns out, one of the Dutch guys in the office would order that sandwich every time he was visiting the UK too. I will definetly have to try this! I am always looking for a quick breakfast idea, not to mention one that has bacon! Yum! Thanks for the idea! You can always show me a delicious sandwich you know. Especially one which originally uses stroop. I never actually use stroop on my pancakes, which is how it sort of is intended but on sandwiches like this I can kind of see how delicious it would be! Hi Cath! Mango jam!! Another favorite 🙂 I love it with melted gruyere! Hi Midge! Stroop is indeed the perfect sweet component for bacon 🙂 Although yes, maple syrup is fantastic as well! Hi Krizia! Thanks for stopping by! That combination sounds so yummy! Hi Dianne! That sounds yummy! Time to whip out the panini press! Hi Abigail! Hope you like it! I drooled at the mention of guava jelly. What a great combo for a sandwich. Thanks for sharing – I'm off to take the bacon out of the freezer as I type this. We've had this horrible storm the past week, and been trying to cook everything in the freezer. 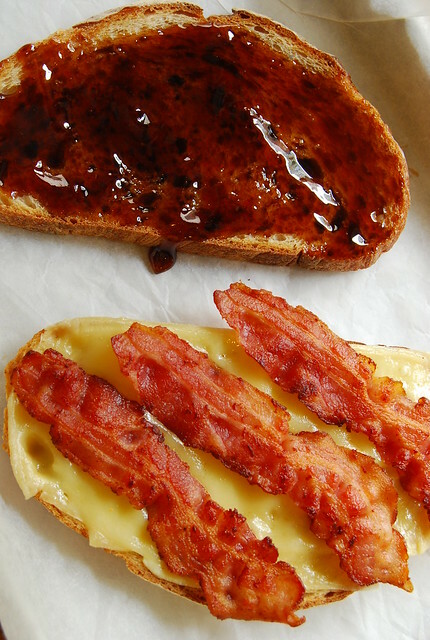 Your sandwich is a good excuse to cook bacon. Thanks for sharing & hope you're feeling better! Can't get enough of lists! it's like looking into someone's private world of desires! Oh, and I love ANY kind of sandwich that involves a pig in it – bacon, gaunciale, ham, sausage, etc. I guess it wasn't so much of a sandwhich but a burger called peanut butter and jealousy. It was really good. It was a hamburger patty, peanut butter, jelly, and bacon in a hamburger bun. Very tasty, a riff on a sandwich I guess you could say. Hi BettyAnn! Guava jelly must be one of my favorite jellies ever! 🙂 Hope you weathered the storm well! Hi Fork and Whisk! Peanut butter and jealousy…what a cool name for a sandwich! of course i saw this late. thanks for the mention and for coming to out dessert dinner! great to have had you on the table. and the sandwich looks awesome.